after it was removed from an outside location. Crosses and other religious symbols more than 16 feet high will be subject to the same building ordinances as other structures under a new interpretation by city officials. The administration of Mayor Jeremy Harris came up with the new interpretation when it rejected applications submitted by two men -- one seeking to put up a 20-foot symbol of Satanism on his residential property, the other applying for a 20-foot symbol representing homosexuality on his lot. "The city has always been committed to equal treatment in the processing of all permit applications," city Corporation Counsel David Arakawa said in a statement. "During the review of this application, we again looked closely at our responsibility with respect to the regulation of symbols and signs. The action by the director of planning and permitting was fair and appropriate." The two men filed their applications when the city allowed Makakilo's St. Jude Catholic Church to leave up a 20-foot cross on its property under the interpretation that only commercial signs, not religious ones, fell under zoning and building laws. 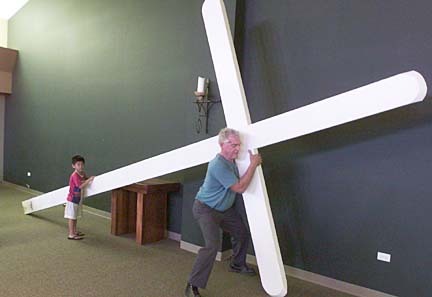 Later, the city contemplated changing their rules to allow 16-foot and taller "symbols," including crosses, to be placed only on properties designated as meeting places which, by law, must be at least 20,000 square feet in size. The change would, in effect, have allowed the cross but not the Satanic or gay symbols. The two men, the Hawaii Citizens for the Separation of State and Church and the American Civil Liberties Union all balked at that proposal, claiming discrimination against smaller groups. The city apparently has dropped those plans. Mitch Kahle, president of the Hawaii Citizens for the Separation of State and Church, was happy with the city's decision. "The city is now regulating crosses and all symbols, as signs," Kahle said. "Anybody who wants to put up a symbol of any kind needs to go through the permitting process for signs." Kahle said he was told that any symbols that are an integral part of a building's architecture may be allowed including crosses on church spires. Also exempt are any symbols put up before 1969, the year city building and zoning codes were first instituted. Examples include the "Jesus Coming Soon" signs of the Apostolic Faith Church.